The initial code that the topic starter used a loop through all objects, and used hitTestPoint-function to detect if the light hits a wall. Therefore he used a loop with 360 steps, used for all directions. In the innerloop it tries if it hits the wall, otherwise goes away from the light (using the direction of the outerloop), tries if it hits the wall. That loop goes on till it does hit a wall. It is a bit of trial and error, but I think it is very clever. At the end of each loop a lineTo is used to draw the light, so in the end it will be a shape with 360 vector points. I also wanted to make it look more realistic. Having light only is not close enough to realism. It needs shadows. I created an inverted shape of the light-shape and filled it with black (a). This creates a nice shadow, however has very hard bounds, which is ugly. So then I took the shape again and drawed with a nice transparent to black gradient (b). Those 2 layers have the BlendMode ALPHA. The holder of those has a solid shape fill (as big as the stage) with BlendMode LAYER. This creates a nice ‘hole’ which I think works very well as shadow if you make it half-transparent. 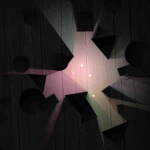 Oh, the colored light-layer (c) is a gradient too, with the same shape as b, only with BlendMode ADD. Another optimization I used was to use graphics data API. In this case I have 1 shape which could be reused 3 times. So before even drawing, I collect all points and commands in an Vector. When I have all data collected, it draws the light-layer and shadow-layer at first, then it pushes some extra points to the Array to make the outer shadow-layer. So with 1 Array of (manipulated) data I could draw multiple shapes. That’s a good case of using the graphics data, I guess. But it is still too slow.. The most intense about this thing isn’t the calculation, but the rendering itself. The whole ‘canvas’ needs to be updated and redrawed every frame with lots of layers and blendmodes, which is very intense for the CPU. I don’t know if this would be possible with Stage3D, but that would be the last step to render really fast. And when that is possible, I’ll guess I could move the object real-time too, which makes it very interesting for games. Let me know what you think about it and how does it perform on your computer? On my computer it stutter a little sometimes, especially with the auto-moving light, and the edges of the shadows flicker a little. But the idea is here, nice optimization work you’ve done here, and I’d really like to see the difference in terms of performance with Stage3D ! Try pixelbender to draw your scene. @rackdoll Thanks for the reply, how exactly would you render this kind of scene with pixelbender? You can try maing a pixelbender filter which takes an vector of pixel values.